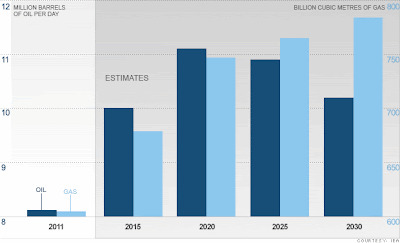 This was on the front of money.com this morning with the caption: "Huge US Oil Boom ahead: The U.S. will overtake Saudi Arabia to become the world's biggest oil producer before 2020." I was shocked at first glance, because I thought oil production was going to go up 10 or 20-fold from the tiny amount in 2011 to the huge amount in 2015. That does indeed sound huge. Then I looked at the left y-axis, where I can see it is only going from 8 million to 10 million barrels a day, an increase of about 25%. Fine, you say, but you can still easily see that the light blue bar is above the dark blue bar starting in 2025, showing the US overtakes Saudia Arabia. I'm afraid not. The two bars are not Saudia Arabia versus US production but oil versus gas production, and it is not even clear whose production is depicted. Is the the whole world, the US, Saudi Arabia? The article puts US production at 5.8 million barrels a day in 2011, so it appears not to be US production, but other sources put it at closer to 9 million, so maybe it is the US. Ok, you say, despite the poor caption, at least you can clearly see that gas production begins to top oil production (in whatever country the graph is depicting) around 2025. Not really. Since oil is in millions of barrels per data and the gas is in billions of cubic meters (per day, per month, per year, who knows? ), this is actually not the case. The year 2030 shows oil at about 10 million barrels per day and gas at nearly 800 billion cubic meters. Which is more? Maybe the readers of money can quickly translate these figures into BTUs or some useful measure of production output, but I sure can't tell you. Fine, you say, but since they start at about the same level, we at least know that gas increases more than oil over the time period. Sorry, even that is incorrect. Look at the scale on the left axis (oil), which starts at 8 and goes to 12, a 50% increase. The right axes starts at 600 and goes to 800, a 25% increase. Thus, oil goes from 8 to just over 10 (more than a 25% increase) while gas goes from a little over 600 to just little under 800 (less than a 33% increase--maybe a little more than oil but maybe not). The only thing that appears to be correct about this graph is the year, until you realize that in the first period, there are only four years (2011-2015) while in the other periods, there are five year differences.